Family Rosaceae Juss. genus Armeniaca Scop. It is a small tree or shrub, up to 3 m tall. Stems and larger branches are covered with gray bark, often cracked. Younger branches are grayish-fulvous or red-brown. Leaves are 2-10 cm long and 2-7 cm wide, ovate, broadly oval, circular, with an abruptly tapered tip and a broadly cuneate, circular or cordate base, finely dentate along the edge, almost naked from above and with pubescence in the nooks of veins from below. Petioles are thin, grooved, 2-3 cm long. Flowers are pink, less frequently white and sessile, or set on very short pedicels up to 2 mm long, shorter than the tube of the corolla. Fruits are 1.2-2.5 cm in diameter, spherical, downy, yellow, with or without erubescence, dry, inedible, often chapping at maturity. Stones are easily detachable from the pericarp, fulvous-yellow, with a sharp rib at the ventral suture. Entomophilous. Autochore. Plant is characterized by having rapid growth. It is propagated by seed and summer cuttings. Seed needs to be stratified for 3 months at 1-5 degrees Centigrade. Blossoms in May, bears fruit in July-August. It is distributed throughout Eastern Siberia (Southern Trans-Baikal region), Maritime Territory of Russia (Southern Ussuri region), Mongolia, Northern and North-Eastern China. Xerophyte. Photophilous. It grows on dry stony mountainsides, on rocks, sometimes under a canopy of dry thin forests, often with oak and Manchurian apricot. This species can be crossed with Manchurian apricot and other species of the same genus. It surpasses other apricots in frost- and drought-resistance, being therefore promising for breeding as an initial source of variation. 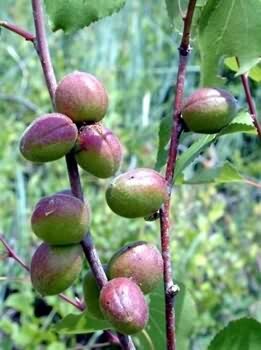 It may be used as seedling stock for other stone fruit plants.